Top 5 Tips for Home Security - FitzPerfect Windows - Doors and More, Inc. Your home is your sanctuary, a place you can unwind and relax at the end of a long day, leaving the cares of the world behind you. However, even the most relaxing and serene home can be vulnerable to interruptions from the outside world. Dangerous weather and intruders can pose a threat to your home’s sense of peace and security. At FitzPerfect Windows – Doors and More, we understand that your home security is of the utmost importance to you and your household. If you are looking for ways to brush up on your home security, follow these tips to ensure that your home is as safe as possible. In addition, because the world can be an unpredictable place, we offer a variety of security door products to help enhance your home’s security and give you peace of mind. 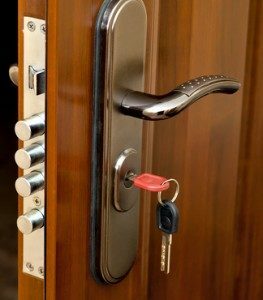 Your locks are a vital part of your home’s security. Unfortunately, there are times when your locks can be compromised. If you have given a copy of your key to someone that you have since cut ties with, such as an ex or a housekeeper, you need to change the locks on your home. Even if you fully trust everyone who has ever had a copy of your key, you never know where that key might end up by accident. Additionally, if you have lost any of your house keys, go ahead and change your locks. It is always better to endure a little bit of inconvenience and be safe, than it is to deal with the trauma and hassle of a home invasion and be sorry. Your windows should be securely locked at all times. If your windows are older and the locks are damaged or missing, consider replacing your old windows with newer, more secure varieties. In the meantime, you can buy window locks at your local hardware store. However, because older windows tend to become warped and less secure over the years, replacing your outdated windows should be a priority for your home security. At FitzPerfect Windows – Doors and More, we offer a variety of beautiful new windows to help increase your home’s security. Many homeowners leave a spare key outside under the mat or a nearby pot. Leaving a key outside where it can be found by a potential home intruder is dangerous. Instead, consider giving a spare key to a trusted neighbor, friend, or family member to keep on their key ring. If you get locked out, you can always call them for help getting into your home. If you already have a security system or alarm, make sure it is activated and you understand how to use it correctly. If not, consider having one installed. Even a simple WiFi-enabled camera near your front door can be enough of a security system to deter a potential burglar. Security doors are similar in appearance to traditional wood or fiberglass doors, but are actually made of stronger material and design than typical doors. Reinforced with steel, security doors are made with your home safety in mind. In addition to the reinforced strength of security doors, they are made with hidden hinges, making it impossible for would-be intruders to remove the hinge pins to get into your home. Security doors are much more difficult to kick in or otherwise break into than traditional entry doors, making them an ideal, long-lasting choice for increasing your home security. In today’s world, home invasions can happen anywhere. Whether you live in Vacaville, Fairfield, Vallejo, Napa, or another part of northern California, it is an unfortunate reality that criminals target homes all over the place. Even quiet communities can become targets for experienced home invaders. While burglaries and other home invasions are an unfortunate reality across the country, there are steps that you can take to fortify your home and reduce your likelihood of becoming a victim. Once you have implemented these simple steps, consider upgrading your entry doors to security doors. Our team of experts at FitzPerfect Windows – Doors and More has the knowledge and experience necessary to help you select the perfect security door or doors for your needs. If you are looking for a Replacement Windows & Doors Expert in the greater Vacaville and Fairfield area then please call 707-452-8844 or complete our online request form.